OLDMELDRUM, (properly Old Meldrum before the Post Office interfered, but known locally as “Meldrum”) is rightly famed for its sense of community. Once settled here people are very reluctant to leave. This Baron Burgh was the former local authority headquarters for Fortmartine and Garioch and the centre of the settlement is designated a conservation area, steeped in history. The town with the “village” atmosphere continues to grow and recently enjoyed a significant expansion to the Primary School and the opening of a new community school: Meldrum Academy. There are numerous clubs, societies and activities for children. St Matthews Church handily placed for commuting to Aberdeen by road on A947 (11 miles from Dyce) Oldmeldrum is served by a regular bus service with the provision of a new Park and Ride on the outskirts of Dyce in contemplation. 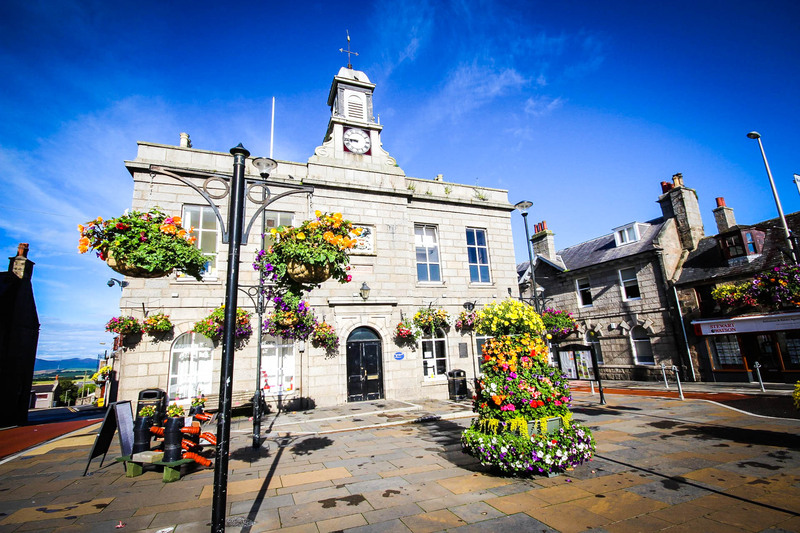 Oldmeldrum is served by a significant local industrial estate, and a range of local shops equipped to serve most needs: the town is served by a Health Centre, Chemist, Dentist, 4 different hair salons, Veterinary Surgery, two churches , Police Station and local Solicitors. For the keen sportsmen, Golfers are served with memberships available from 2 local golf clubs (each 18 holes with driving ranges and teaching professionals) and many others within easy reach and there are outdoor bowls and tennis facilities in addition to the all-weather and indoor facilities at the Academy. Trout fishing is available at nearby Lochter Visitor Centre. Situated in a central inland location, close by an iron age hill fort and away from the sea haar, there are tremendous views to be had over the surrounding valleys. Oldmeldrum is well placed for access to the Archeolink at Oyne and the popular walks and visitor centre at Bennachie as well as the Castle and Whisky trails, with the local Distillery (“Glengarioch”) producing malt for blending and the brand of choice adopted by the National Trust for Scotland who have many historic properties within easy reach. A prominent feature of the Highland Games circuit is the world famous Oldmeldrum Sports held in the third week of June each year.